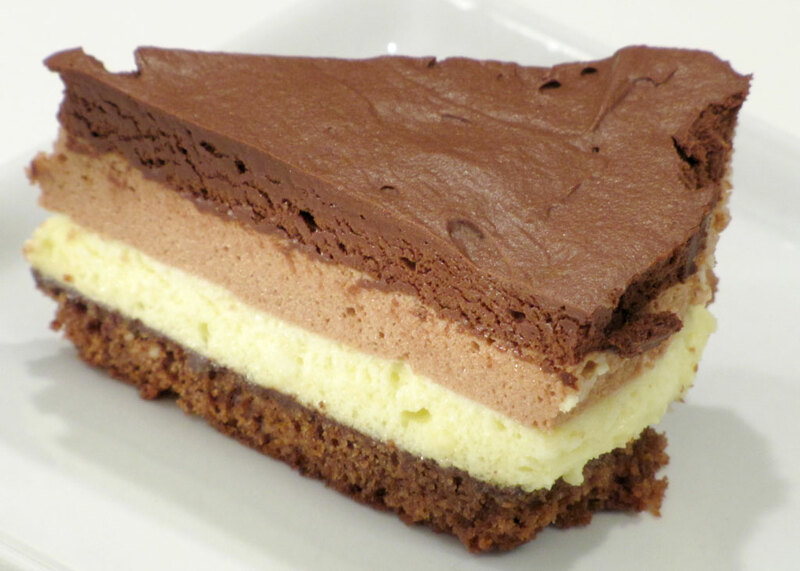 1 layer of chocolate "layer cake sponge"
Sprinkle the cake bottom generously with Grand Marnier, Cointreau or orange juice. Cover it with the ganache. Put it in the bottom of a spring form, so that it fits snugly. Put it into the fridge. Whip the cream. Save 2 tablespoons. Beat the egg whites completely stiff. Melt the gelatin in the 2 tablespoons cream you saved earlier. Mix the egg yolks into the whipped cream. Mix the melted gelatin and cream into the melted chocolate. Mix the whipped cream and the chocolate. Mix in the beaten egg whites. Pour into the spring form and smooth it out. 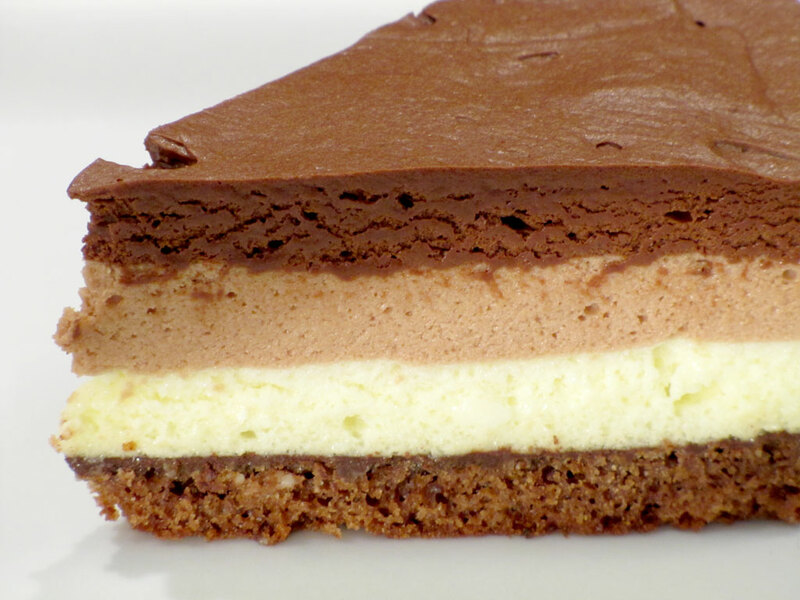 Put the cake into the fridge for at least 4 hours before serving. This is a hard cake to make succesfully, so I have tried a few methods. I dry the gelatine on a cloth, so there is as little water as possible. Then I melt the gelatine with cream, mix together, etc. The key to getting it to work is to get it all done in a single "movement" so it happens very quickly. If it starts to lump proceed with the next step quickly. the problem is that it is a cake I got in a little French bakery in the south of France, which I have not seen elsewhere, but I was completely in love with it. Unfortunately I have not found anything but loose sketches in French to how it should be done. So I experimented a bit with it over time and got the above recipe to work. A normal chocolate mousse collapses after a day or so. So there has to be gelatine in it, in order for it to keep a day or two. This is what causes the problems. To get the gelatin mixed in at the right time. I am experimenting still to do it differently because I think that the above process is cumbersome and difficult. Melt the gelatin gently in a pot with a bit of cream. Beat the egg whites completely stiff in a bowl. Whip the cream in another bowl. It's the start of the "basic mix". Fold the egg yolks into the "basic mix". Pour a bit of the basic mixture into the molten chocolate, so that the chocolate becomes thinner and easier to work with. Then fold the chocolate mix into the "basic mix". Fold the gelatine into the "basic mix". Fold the egg whites into the "basic mix". That way is easier, as I said, but I find that the mousse will be a little heavier. The cake was still a big hit though. The cake I used for pictures in this recipe was made with this method. Hmmm ... it is one of those recipes that really could use a video.